For the present day quarter in Istanbul, see Karaköy. For the hill in Romania, see Seven hills of Iaşi. It has been suggested that this article be merged into Karaköy. (Discuss) Proposed since July 2014. A view of Galata (modern Karaköy) with the Galata Tower (1348) at the apex of the medieval Genoese citadel walls, which were largely demolished in the 19th century to enable northward urban growth. Galata was a neighbourhood opposite Constantinople (today's Istanbul), located at the northern shore of the Golden Horn, the inlet which separates it from the historic peninsula of old Constantinople. The Golden Horn is crossed by several bridges, most notably the Galata Bridge. The medieval citadel of Galata was a colony of the Republic of Genoa between 1273 and 1453. The famous Galata Tower was built by the Genoese in 1348 at the northernmost and highest point of the citadel. At present, Galata is a quarter within the borough of Beyoğlu in Istanbul, and is known as Karaköy. There are several theories concerning the origin of the name Galata. According to the Italians, the name comes from calata (meaning "downward slope"), as the neighbourhood is sloped and goes downwards to the sea from a hilltop. The Greeks believe that the name comes either from galatas (meaning "milkman"), as the area was used by shepherds in the early medieval period, or from the word Galatai (meaning "Gauls"), as the Celtic tribe of Gauls were thought to have camped here during the Hellenistic period before settling into Galatia in central Anatolia. The inhabitants of Galatia are famous for the Epistle to the Galatians and the Dying Galatian statue. Minaret of Arap Mosque, originally the belfry of the Church of San Domenico (1325) built by Dominican friars in Galata. Galata Tower was built in 1348 at the northern apex of the Genoese citadel. Bankalar Caddesi (Banks Street) in Galata was the financial center of the Ottoman Empire. An aerial view of the Golden Horn's entrance, with Galata in the foreground and the Seraglio Point in the background. In historic documents, Galata is often called Pera, which comes from the old Greek name for the place, Peran en Sykais, literally "the Fig Field on the Other Side." The quarter first appears in Late Antiquity as Sykai or Sycae. By the time the Notitia Urbis Constantinopolitanae was compiled in ca. 425 AD, it had become an integral part of the city as its 13th region. According to the Notitia, it featured public baths and a forum built by Emperor Honorius (r. 395–423), a theatre, a porticoed street and 435 mansions. It is also probable that the settlement was enclosed by walls in the 5th century. Sykai received full city rights under Justinian I (r. 527–565), who renamed it Iustinianopolis, but declined and was probably abandoned in the 7th century. Only the large tower, Megalos Pyrgos (the kastellion tou Galatou) which controlled the northern end of the sea chain that blocked the entrance to the Golden Horn remained. In the 11th century, the quarter housed the city's Jewish community, which came to number some 2,500 people. In 1171, a new Genoese settlement in the area was attacked and nearly destroyed. Despite Genoese averments that Venice had nothing to do with the attack, the Byzantine Emperor Manuel I Komnenos (r. 1143–1180) used the attack on the settlement as a pretext to imprison all Venetian citizens and confiscate all Venetian property within the Byzantine Empire. The kastellion and the Jewish quarter were seized and destroyed in 1203 by the Catholic crusaders during the Fourth Crusade, shortly before the sack of Constantinople. In 1233, during the subsequent Latin Empire (1204–1261), a small Catholic chapel dedicated to St. Paul was built in place of a 6th-century Byzantine church in Galata. This chapel was significantly enlarged in 1325 by the Dominican friars, who officially renamed it as the Church of San Domenico, but local residents continued to use the original denomination of San Paolo. In 1407, Pope Gregory XII, in order to ensure the maintenance of the church, conceded indulgences to the visitors of the Monastery of San Paolo in Galata. The building is known today as the Arap Camii (Arab Mosque) because a few years after its conversion into a mosque (between 1475 and 1478) under the Ottoman Sultan Mehmed II with the name Galata Camii (Galata Mosque; or alternatively Cami-i Kebir, i.e. Great Mosque), it was given by Sultan Bayezid II to the Spanish Moors who fled the Spanish Inquisition of 1492 and came to Istanbul. In 1261, the quarter was retaken by the Byzantines, but Emperor Michael VIII Palaiologos (r. 1259–1282) granted it to the Genoese in 1267 in accordance with the Treaty of Nymphaeum. The precise limits of the Genoese colony were stipulated in 1303, and they were prohibited from fortifying it. The Genoese however disregarded this, and through subsequent expansions of the walls, enlarged the area of their settlement. These walls, including the mid-14th-century Galata Tower (originally Christea Turris, "Tower of Christ", and completed in 1348) survived largely intact until the 19th century, when most were dismantled in order to allow further urban expansion towards the northern neighbourhoods of Beyoğlu, Beşiktaş, and beyond. At present, only a small portion of the Genoese walls are still standing, in the vicinity of the Galata Tower. 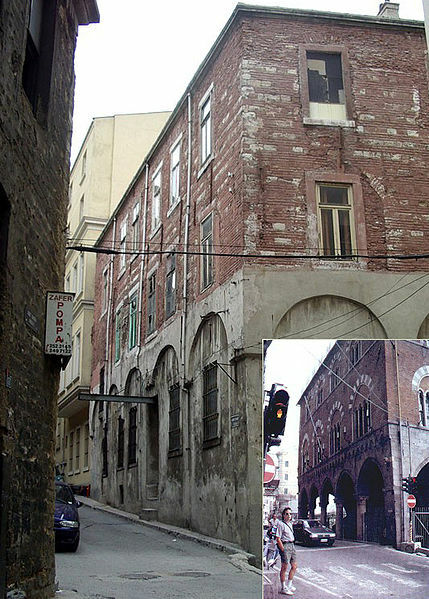 Designed as an identical copy of the 13th century Palazzo San Giorgio in Genoa, the palace of the Genoese podestà of Galata, Montano de Marinis (which was known as the Palazzo del Comune (Palace of the Municipality) in the Genoese period and built in 1316), partially stands in ruins on Kart Çınar Sokak; a narrow side street that's parallel to the neighbouring Bankalar Caddesi (Banks Street) which was the financial center of the Ottoman Empire. The front facade of the palace on Bankalar Caddesi (together with circa 2/3 of the building) was demolished in 1880 for constructing the street's tramway line (later replaced by a 5-floor building named Bereket Han), while its rear facade on Kart Çınar Sokak (and the remaining 1/3 of the palace building) is in ruins and currently undergoing restoration. Bankalar Caddesi has rows of Ottoman-era bank buildings, including the headquarters of the Ottoman Central Bank, which is today the Ottoman Bank Museum. Several ornaments that were originally on the facade of the Genoese Palace were used to embellish these 19th-century bank buildings in the late Ottoman period. The Camondo Steps, a famous pedestrian stairway designed with a unique mix of the Neo-Baroque and early Art Nouveau styles, and built in circa 1870–1880 by the renowned Ottoman-Venetian Jewish banker Abraham Salomon Camondo, is also located on Bankalar Caddesi. The seaside mansion of the Camondo family, popularly known as the Camondo Palace (Kamondo Sarayı), was built between 1865 and 1869 and designed by architect Sarkis Balyan. It is located on the northern shore of the Golden Horn, within the nearby Kasımpaşa quarter to the west of Galata. It later became the headquarters of the Ministry of the Navy (Bahriye Nezareti) during the late Ottoman period, and is currently used by the Turkish Navy as the headquarters of the Northern Sea Area Command (Kuzey Deniz Saha Komutanlığı). The Camondo family also built two historic apartment buildings in Galata, both of which are named Kamondo Apartmanı: the older one is located at Serdar-ı Ekrem Street near Galata Tower and was built between 1861 and 1868; while the newer one is located at the corner between Felek Street and Hacı Ali Street and was built in 1881. Galatasaray S.K., one of the most famous football clubs of Turkey, gets its name from this quarter and was established in 1905 in the nearby Galatasaray Square in Beyoğlu (Pera), where Galatasaray High School, formerly known as the Mekteb-i Sultani, also stands. Galatasaray literally means Galata Palace. View of the Galata Tower from Eminönü, 12 April 2005. View of the Galata Tower from the Bosphorus. View of the Galata Tower from the Anatolian side of the Bosphorus. View of the Galata Bridge, with the Galata Tower in the background. View of the Galata Tower from the main square in front. Janin, Raymond (1953). La Géographie Ecclésiastique de l'Empire Byzantin. 1. Part: Le Siège de Constantinople et le Patriarcat Oecuménique. 3rd Vol. : Les Églises et les Monastères (in French). Paris: Institut Français d'Etudes Byzantines.